Katie Flegenheimer, a Saginaw, Michigan, native, has always had a love for the arts. Growing up, she loved to paint and draw and would sit by her grandmother, who is also an artist, drawing stills in her home. But when it was time to attend college, Flegenheimer wasn't sure she wanted to pursue the career path of a studio artist. With the encouragement of one of her high school teachers, Flegenheimer decided to study graphic design and found a school that allowed her to pursue all of her passions: the IU School of Art and Design. "What I like about IU is that I can study graphic design while having the opportunity to take business classes and get a marketing minor," said Flegenheimer, a senior pursuing a Bachelor of Fine Arts degree. "I knew I didn't want to become a studio artist. Design is a way for me to use the skills and things I love about painting and drawing and channel them into a career." While Flegenheimer initially tried to shake her strongly driven, academic-focused personality when she first attended college, she quickly realized that being a hard-working, passionate person was simply who she was. Instead of fighting it, she learned to embrace it and combine it with her desire to create. 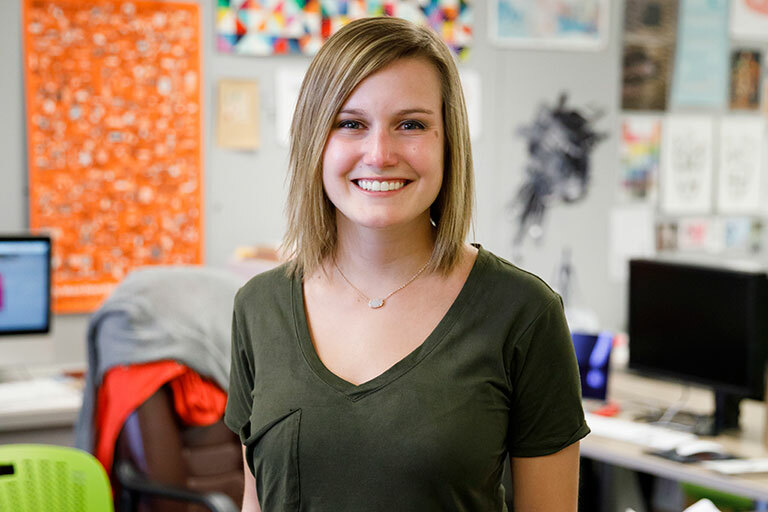 Throughout her almost four years at IU, Flegenheimer has worked as a freelance graphic designer. Through internships, class and work, she has created projects for Cook Medical, Angles Café and Gift Shop in the Ezkenazi Museum of Art, IU's Turkish Flagship Center and F.P. Horak, a small marketing firm in Michigan. She also works as a graphic design intern at the Center of Excellence for Women in Technology at IU Bloomington. "An element that I use consistently in my designs is type as image," she said. "I enjoy manipulating letterforms to create a pattern or showcase an idea that is more than just the word they create. "I also love iconography; simple icons can communicate a great deal, and icons help balance typography. I like using bold colors and trying unique color palettes when I create a project." Her commitment to her work is one of the traits that makes the IU senior stand out, said Jenny El-Shamy, a senior lecturer in graphic design at IU's School of Art and Design. "She is focused, mature, talented and responsible," said El-Shamy, who met Flegenheimer during the student's sophomore year. "She excels in her academic studies and is looked up to and respected as a leader among her peers. She consistently proves to be one of the most driven students in our undergraduate program, and she is by far one of the most dedicated students I’ve ever had the pleasure to teach." 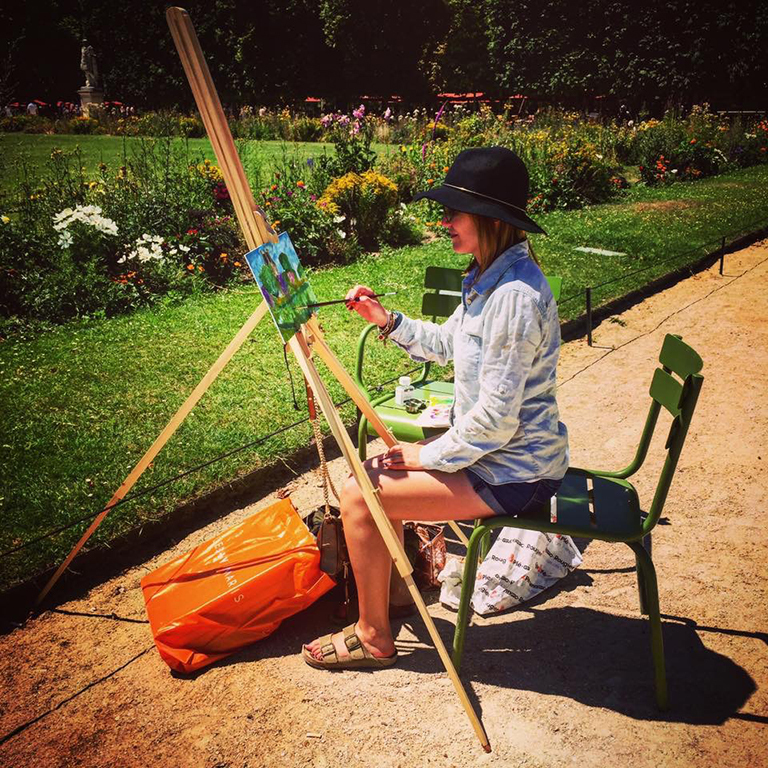 Flegenheimer painting during a study abroad trip to Paris. One of the biggest projects Flegenheimer has worked on to date is her current thesis project, which she is wrapping up now in anticipation of displaying it during a show at the Grunwald Gallery from March 27 through April 1. Inspired by her previous trip to Paris, her project is a mock-up of an online travel guide to Paris, called "PreParis." The guide will help people who might be intimidated or overwhelmed by the cost, language barrier or other factors of traveling to Paris plan a trip there. Although not an official website, Flegenheimer's project will allow participants to walk-through the process of choosing travel dates and picking categories they would want their trip to focus on -- food, museums, parks, historic sights, nightlife, etc. The website would then generate an itinerary, both online and in print, based on their choices and location of the activities. When everything is said and done, she will have clocked close to 200 hours working on her project, a feat Flegenheimer is proud of. "While a lot of work, what I really liked about this project is it allowed me to revisit a place that I love, Paris, and to balance intensive research with creativity," she said. When she is not in class or freelancing, Flegenheimer enjoys spending time with her friends and roommates, who she met when she joined Alpha Delta Pi sorority her freshman year. She has also served on the School of Art and Design's social media team; is involved in Mortar Board, a campus honor society; and was a member of IU Dance Marathon, where she served as chair of the merchandise and apparel committee. Flegenheimer during an IU Dance Marathon event. Photo courtesy of Katie Flegenheimer. 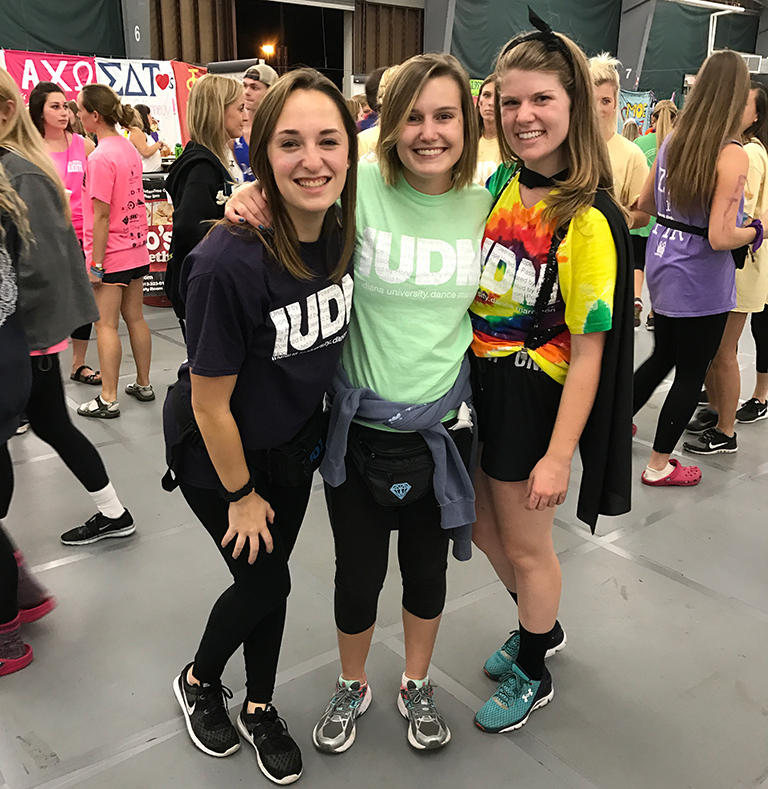 "IUDM is one of my favorite things I did in college," she said. "I've always found it to be really important to give back to the community. I love IUDM because I've been able to give back in a huge way while getting to know lots of wonderful people also involved. "It has been very rewarding to work my way up to a chair position as a senior. Taking on a leadership role in this organization was a great experience where I was able to foster my leadership skills and shape the character of the committee." As May nears and Flegenheimer prepares to graduate, she said her experience at IU Bloomington has been nothing less than exceptional. Although like most freshmen who struggled at first to find her way and make new friends in a new town, she said the campus has helped her find her way and become stronger and more independent both academically and personally. "Things really turned around for me when I joined my sorority and I became more involved on campus," she said. "I remember calling my mom and saying, 'Mom, there are people similar to me at IU.' Having great professors who have helped me grow as a designer has also helped shape my experience at IU. "It's hard to believe that I'll be graduating in just a few short months, because IU has become my home away from home. I have overcome challenges and benefited from working through difficult times. I have grown so much as a person during my four years in college, and even though it's nerve-wracking, I feel prepared to move on to my career and the next step of my life."